In culinary conversation, the term herbs refers to the leafy part of a plant that, unlike vegetables, is used to add flavor to food, not substance. Herbs can be found in a spectrum of different plant categories: some are perennials (thyme and lavender), others are biennials (parsley) or annuals (basil); some are shrubs (rosemary), and others are trees (bay laurel). Herbs are also used widely for medicinal and religious purposes and can be useful for pest control as well. 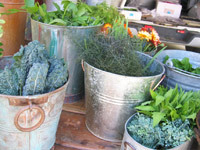 Fresh cut herbs are best stored in the refrigerator, kept in dry plastic bags or dry plastic containers. Add fresh herbs as a final ingredient to soup, stew, or salad to enhance the dish’s flavor. And, if you’re interested in taking small steps to becoming more sustainable, growing herbs at home in a planter box or backyard garden is a perfect place to start.